Yes, it is finally here. Android addicts around the world gave a huge shout of joy when they heard that the beta version of Android L had released earlier this month. Though the official release of Android L will happen later this year along with launch of Google Nexus 6 smartphone, the beta version (Android L developer preview) is out there for all Android fans. The L Preview can be installed on Nexus 5 and the Nexus 7, but it would not be advisable unless it's a spare phone or tablet as yet. The reason behind this is because it is not a stable release yet and there might be errors still present in the operating system that could cause some serious damage to your computer system and the data. So, before anything else, let's warn you that there could be damage by installing the Android L preview but the great news is that everything can be set back to the earlier factory settings. The only thing you need to keep in mind is that you take a backup of the data so that you don't lose anything. To help you install and enjoy the features of the new Android OS, I have listed a step-by-step guide to download Android L in this article. The first thing you need to do is download a 2MB installer that has the Android ADB and the fastboot tools, this forms the XDA thread that is absolutely essential to download the Android L image. Plus, this is a lot safer and easier than taking the entire Android SDK – it's huge in size and not really necessary if you want to install Android L beta version. When you download the files, don't bother changing the location of the file. It will install right and you should be with a command prompt window. Your Nexus would be connected to the USB and would be switched on, go to the devices and printers tab on the control panel of your laptop. Your phone would be listed as an MTP (under multimedia devices). Go to the properties, the hardware tab and then choose Nexus 5 in the options, and update the driver to the same folder. You must allow USB debugging again. Restart the phone while connected to the USB in the fastboot mode. The lock state can be opened in CMD prompt by 'fastboot oem unlock'. You can erase the device by selting the option (using volume button). You can complete the Google Android L installation by typing flash-all. Once complete, lock bootloader and start the device in the fastboot mode. Your phone would be in the state as in step 4, unlock similarly. Remember that you stand no risk in losing data when you lock the device, but only when you unlock the device. How to configure Android L launcher on Nexus 5 or similar Kitkat devices? Are you looking for ways to make your Kitkat theme look like Android L OS on Nexus 5 smartphone? Want to know about useful tips to install Android L on Nexus devices? Please read further to know about the Google Android L theme app and how Android L launcher can be configured for Nexus 5. 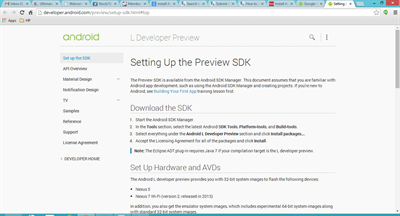 Here, I have listed steps to try out Android L developer preview on Nexus 5 device i.e. steps to upgrade to Android 5.0 L on Kitkat devices like Nexus 5. How to change navigation and status bar like Android Lollipop in Moto E? Need to change your Moto E home screen look like Android L? In this article I have given the tutorial to make your Motorola Moto E to look like the latest Android version. Read the article to find the instruction and screen shoot to install Android L theme in your Moto E.
Nice information shared in this article about how to install the Android L developer software but I think that this software will not be easy for common users to operate on Android device as it may damage the default software in the device if operated wrongly.